One of the most tragic events in local history occurred in Belle River, a town located 20 miles east of Windsor, on August 18,1868. Two steam sawmills in the village, caught fire; foul play was suspected. The blazes proved to be the work of an arsonist. The mystery deepened when the bodies of three individuals were found – previously murdered. Here is the story about this nearly forgotten fateful event of 135 years ago. Between 1850 and 1867, British immigrants moved into the Village of Rochester to join French Canadians who had lived in the area for years and who formed the nucleus of the county’s population. An Englishman named Charles Chisom accumulated many village lots and farm properties, particularly on the north side of the Great Western Railway, which passed through the village. He also owned property on both sides of Tecumseh Road, and a large part of the eastern end of the village. Chisom had become powerful and influential, and held a number of positions in local government. 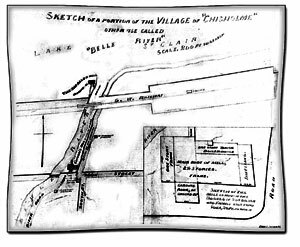 He even succeeded in having the village, known as the Police Village of Rochester resurveyed and its name changed to “the Village of Chisholme” in 1857, although the name later became Belle River. The events leading to the murders coincided with the arrival of an American businessman from Chicago, Abraham Van Orden, who came to Belle River with his wife and teenaged grandson in January 1868. Van Orden was a member of the Van Orden family of Greene County, New York. Abraham moved to Chicago, and later to Detroit. By the time Van Orden arrived in Belle River he was about 50 years old. He had a successful business career in Chicago and brought a considerable amount of money with him, intending to settle in a small Canadian community. Van Orden was soon negotiating to buy Chisom’s mill. Apparently a satisfactory bargain was struck, for Van Orden and his family moved to Belle River shortly thereafter. One of the most lamentable, and disastrous fires which ever transpired in this section of the country, occurred at Belle River on the line of the Great Western Railway, on Sunday morning last, whereby three estimable human beings were lost and large and valuable properties destroyed. ... This mill, it at once became apparent, must have been set on fire by an incendiary, from the fact that it was seen to burn on the south east corner in a distant portion of the mill where the boiler and engine were located. And, moreover, a passerby discovered in the vicinity not far from where the fire was seen, a jug which, it was quite evident, had but a short while ago contained a quantity of kerosene oil. This was about a quarter to 1 o’clock a.m. The Belle River Mill was a mass of burning ruins. 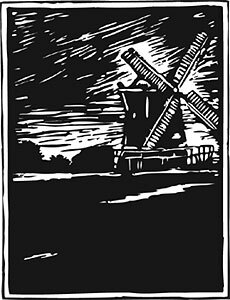 It then flashed through the minds of some persons to enquire where Mr. Van Orden, who worked the mill, and family, who, it was known, occupied a portion of the Belle River Mill, were. A search of the ruins of the mill led to the discovery of the bodies of Abraham Van Orden, his wife Elizabeth, and his 15 year old grandson James. ... That both these mills were set on fire by some evil disposed person, there appears to be not a shadow of doubt, and, more horrible than all, it seems to be most indelibly and to us reasonably, too – impressed on the minds of the inhabitants of Belle River, that a triple murder was previously foully perpetrated! The basis of this theory is as follows: Mr. Van Orden had been at Windsor on the previous Saturday, where he was engaged in an arbitration concerning the possession of the Belle River mills. In the afternoon of that day, he returned home by the train, and it is known that he brought with him a considerable sum of money – how much is not said – but it is a fact, we believe, that evening he showed some $500 in silver to one man, and, before leaving Windsor, had lent a quantity of money to another person. Then, just before the fire broke out, three or four distinct pistol shots were heard in the vicinity of the mill by several persons, and a few minutes later a person was seen behind the mill. This was about midnight a little after the mill was on fire. Now what did Mr. Van Orden do with the $500? What were the three or four pistol shots for? And more strange than all, how was it that not one of the Van Ordens, if not killed, did not leave the building, or show themselves at the windows – which were open, before or when the fire reached them, which it must have taken some minutes to do, from the time it was first seen by the villagers? The painful conclusion forces itself upon our mind, as well as it has forced itself upon the minds of the inhabitants of Belle River, that a hellish triple murder was first committed, followed by a robbery, and the whole of a series of damnable crimes, wound up by a double incendiarism, whereby the three dead bodies of the unfortunate Van Ordens were consumed along with two valuable steam mills! Should these surmises turn out to be correct, hanging, drawing, and quartering would be too mild a treatment for the hellish perpetrator of such a fearful catalogue of guilt. This sketch of the mill where the Van Orden family lost their lives on August 30th, 1868, was prepared as evidence for the autumn Essex Assizes, which began in the Sandwich Court House on Tuesday November 10th, 1868. Other than this sketch, now in Windsor’s Community Museum, there are no longer any official records of the fire and the ensuing investigations and murder trial. The Van Allen Mill, seen in the upper left of the sketch, also burned on the same day. It was owned by Daniel Ross Van Allen of Chatham. (Chisom): Witness owned the Belle River mill; sold it to Van Orden on the 20th January, and bought it back again in the last of March, closing the bargain on the 3rd day of April. Van Orden commenced a suit in Chancery and the whole matter referred to arbitration, which had not yet been settled upon the award, but both met on Saturday and felt satisfied on how it would go, and witness borrowed some money from the deceased, for his witness, wife, and agreed to treat the deceased as a man. Robarsh and Chisom were arrested, and feelings in the village ran high, for the Van Ordens appeared to have had good friends and neighbours who threatened to lynch “the guilty parties.” On the third day of the preliminary investigation, when the verdict was reached, many villagers signed a petition which was handed to John O’Connor, Member of Parliament. This stated their disgust and strong disapproval that he would agree to be the defense lawyer for the two prisoners. However, the Planet told its readers that such a display of feeling was untoward, for under a British justice everyone had the right to a fair trial. Chisom continued to be active in real estate dealings in Belle River and Rochester, and was a wealthy and powerful local figure until nearly the end of the century. The murderers of the Van Orden family were never officially brought to justice. Click here to read the next article featured from Issue #38.